There are multiple things to consider when it comes to purchasing a new car: What is your budget? What type of vehicle suits you and your family best? Should you buy new or used? There is no one-answer-fits-all when it comes to whether you should buy new or used. It depends on your wants, what you can afford, your past experiences with cars, and how far you drive daily. Warranty coverage. The manufacturer covers its new vehicles under warranty for at least three years. Some last much longer. Under a manufacturer’s warranty, if something goes wrong with the car, it’s the responsibility of the dealer and manufacturer to fix it. Typically, these warranties last from three years or 36,000 miles to five years or 60,000 miles. Reduced maintenance expense. A new vehicle shouldn’t need maintenance for the first several thousand miles. The new vehicle likely won’t need new tires, a battery, shocks, or brakes during its first few years of ownership or longer. Made to order. It’s possible to make your new car just the way you want it or have the dealer search for one with exactly what you want. Plus, the newer the car, the more modern the tech that’s inside. Multimedia and navigation interfaces are improving, so if you have to have the latest in gadgets, the selection will be better with a new car. Buying a new car can be a smart choice if you pick the right car, negotiate, shop for the best insurance, and maintain your car. This is an obvious one: a used car is going to be less expensive. 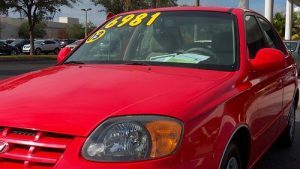 The advantage of the used car price can also allow a buyer to step up to a nicer model. Depreciation. Cars lose value with each passing month and mile, but the biggest decline happens when the car is driven off the dealer’s lot. Some models lose 40% or more of their value in the first year. With a used car, there’s no depreciation when you roll off the lot. Condition. Cars are built to last longer, so you don’t have to sacrifice reliability and overall condition to get a good deal. You can get a used car that’s scratch-free and in excellent mechanical shape. If you have basic knowledge about a car and how it runs, you should be able to find one that is in like-new condition. If you don’t know about cars, you can rely on the certification programs and extended long-term car warranties that most car makers offer. Look beyond the sale price and consider the total cost of buying new in order to get a better idea of how much you are really going to pay for the privilege of being the first owner.